Just days before PS 150 parents be­gan fighting a surprise proposal to move their school to Chel­sea, they were staging a quieter revolt. With the backing of the PTA, the school’s new principal, Jenny Bon­net, is dumping a math program that has long been a staple of PS 150 and other Down­town elementary schools. Parents recently voted to spend $15,000 of PTA money for a more traditional program for the school. It is mo­deled after a method used in Sing­a­pore that is popular among homeschoolers and that several PS 150 parents al­ready use to supplement their children’s learning. The program they have rejected, In­vest­igations, is a product of TERC, an education re­search organization. The method got an early start in the 1990s at Tribeca’s PS 234, a pioneer in progressive math instruction. The PTA’s decision to fund the new method, called Math in Focus, coincided with the new citywide math and literacy tests in April that are based on more rigorous Common Core learning standards. Bonnet, who took the helm at PS 150 in March 2012, said she believes these new standards, which Department of Education officials predict will yield lower test scores this year, are not well aligned with Invest­igations. Investigations, which stresses a conceptual understanding of numbers, is meant to give students a deeper understanding of the theory behind calculations rather than rote problem solving. Proponents also say the method cuts down on errors that result from carrying and “stacking” numbers and provides support material for teachers and parents. While they say no single math program is yet perfectly aligned with the Common Core, they continue to support its use along with material from other sources. But critics like Bonnet complain that the calculation methods are cumbersome and make unnecessary work. Parents at PS 150 who are familiar with Math in Focus say it resembles the way they learned math and that it relieves them of the duty of tutoring their children in basic arithmetic. “Now, my kids can do more things at home not related to schoolwork, and their time in school is going to be more productive,” said Celine Kastoun, who has a first- and a third-grader at PS 150. For PTA President Wendy Chapman, the change couldn’t come soon enough. The mother of a third- and a fifth-grader at PS 150 and a seventh-grader who graduated from the school, she said she sent her two oldest children to a tutor be­cause they—and she—were frustrated by what she considered overly complicated strategies for doing basic arithmetic. “I loved math as a kid, and to have my fabulously energetic, happy, really smart kid tell me she hates math—that crushed me,” Chapman said of her daughter, Taylor, now 10. There is a confusing array of competing math programs to choose from for principals and school districts: Everyday Math, Math in the City, GO Math!, enVi­sion­Math, to name a few. Only one other school in District 2 (Chinatown’s PS 130) is adopting Math in Focus. Most Downtown educators interviewed said they had little firsthand knowledge of the program. 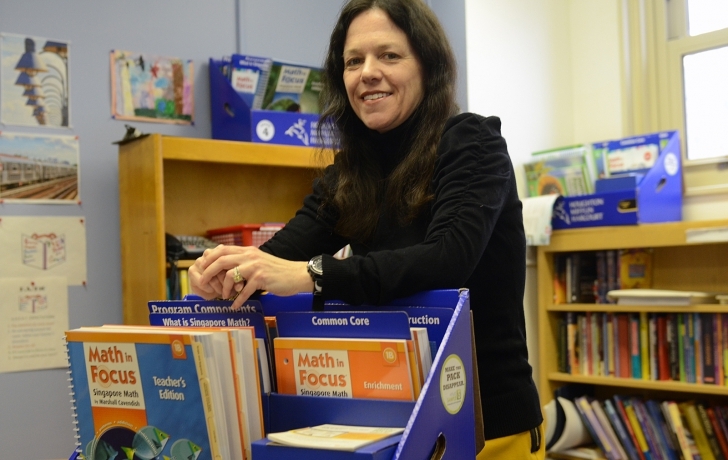 “Why change when you have something very strong and very good?” said PS 234 Assistant Principal Elizabeth Sween­ey, whose familiarity with Invest­igations goes back to 1996 when, as a staff developer, she helped introduce the curriculum in District 2 schools. The school’s principal, Lisa Rip­perger, emphasized that more important than any individual program is support for the teachers. PS 234 has a math and a literacy coach who work only with the teachers. “Nothing to me in my budget is more important than my two full-time content coaches,” she said. At the Spruce Street School, Prin­cipal Nancy Harris said Investigations alone does not align with the Common Core but is a “framework” to build on with “some tweaks” and re­placement units from two other math programs. Ruyter is choosing enVisionMath and supplementing it with aspects of other math programs. The so-called “math wars” have been going on since 1989, when the National Council of Teachers of Mathematics promoted a curriculum that, among other things, deemphasized computational skills. The TERC method grows out of this philosophy, known as “constructivism” or “discovery learning.” It’s a program that Bonnet concedes gives a deeper “number sense” but says its multiple problem-solving strategies confuse many kids.